Having a clean home can help you feel better and more put together in other aspects of life. A clean home can make you more productive at work. You may feel healthier and more alive when your home is neat and tidy. You may even feel happier. The truth is, a clean home is a great thing. The problem is cleaning the home is not so great. We know that cleaning your house is the last thing you want to squeeze into your busy schedule. And cleaning your home only to have it look as though you did nothing the next day is extremely frustrating. This is one reason why many people avoid cleaning their house as much as possible. But clutter builds up, dirt gathers, and you can’t walk anywhere without feeling crumbs or debris from outside stuck to the bottom of your feet. This is no way to live. If you are completely against cleaning your home, but you hate having a dirty home, let the professionals help! Our cleaning team at Clean Bees Homekeepers can help you get your home in tip-top shape and allow you to relax a little. We offer one-time cleaning services as well as repeat services to help you get your home clean when you need it. Whether you want us to stop by every other week, or you simply want us to get your home back in a state that is manageable for you, we can help. While our cleaning services can get your home back in great shape and allow you to walk through the rooms without cringing, there are small cleaning tasks you can do that will allow your home to stay cleaner for longer. This will help you enjoy a clean home between cleanings. To learn some of these cleaning tasks that will help you keep your home clean, read on! Sweeping is a great way to keep your floors clean throughout the week. While you may not need to sweep all of the hard floors in your home daily, the kitchen will likely need a good once-over every day. Stepping on crumbs is not only annoying, but it will spread them throughout the house, making it more difficult to keep the entire home clean. Sweep the kitchen and areas by doors leading outside, these areas tend to attract dirt, grass, and other outdoor debris. Like sweeping, vacuuming the high traffic areas in your home will help keep it clean, plus it will keep your carpet looking better for a longer period of time! 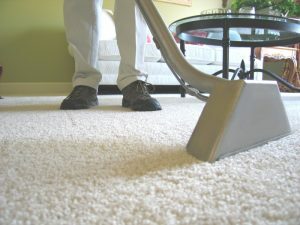 While carpet does a good job of hiding crumbs, hair, and other debris, you don’t want to leave that in your carpet. It is not fun finding out your carpet is full of filth only when you sit on the floor and stand up with crumbs and dog hair all over your pants. Vacuum rooms with carpet, area rugs, and other smaller rugs regularly to help keep your home clean and your rugs and carpet looking better. Your kitchen counters can get dirty quickly. Whether your kids tried making you a pancake surprise or you simply prepared your lunch on the counters, there are likely to be crumbs, coffee stains, and other messes covering your counters. It can be easy to ignore these things, especially if your counters are multicolored and hide these messes well. Try to end every day by wiping down the counters, you may be surprised how many crumbs you pick up along the way. This will help keep them from finding their way to the floors and making your home even messier. While this is not technically a “home” cleaning task, keeping your dishes clean and your sink empty can give your home a cleaner appearance. Plus, by keeping your sink empty, you will reduce the work you have to do later. If you wait until your sink is completely full before you clean the dishes, you will have a lot more work to do. Rather than piling dishes in the sink, clean them or stick them in the dishwasher, your kitchen will look cleaner and you will have less work to do in the long run. No, we are not saying to clean your pets daily. Not only would that be unrealistic, but it can be harmful to their coat and skin! We are talking about cleaning up after your pets. 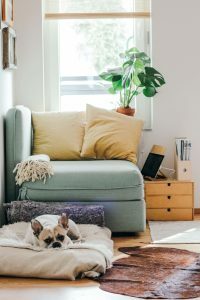 Clean the litter box, remove clumps of hair from the couch, vacuum areas where your dog enjoys sleeping to remove hair, pick up their toys, and keep their food contained in one area. Just because you have pets doesn’t mean your home has to show it. Get a bin for your dog’s toys and make a point to pick them up daily. If your dog or cat is a messy eater, be sure to clean this up. Place dish mats under your pets water and food bowls to ensure the surrounding floors don’t get too dirty. This may be obvious, but letting trash or recycling pile up can make your home look messy and may even cause it to be stinky. If your bathroom, bedroom, or office trash cans get full, empty them into your kitchen trash can (if it is a bigger one) and take the trash out. Empty trash cans can work wonders on the appearance of your home. The same goes for your recycling. While some people have recycling bins in their home, others simply pile it near the sink. If you are one of the sink-pilers, make sure you take your recycling out often to keep your home less cluttered. Along with this, you should also be sure to go around and collect any trash left on counters, tables, or the floors of your teen’s bedroom. This is one of the best ways to keep your home looking clean. Pick up after yourself and try to get your kiddos to pick up after themselves. Don’t leave your coffee mug on the counter all day. Don’t leave a dirty pair of socks on the floor by the couch. Don’t leave throw pillows thrown about! Simply going through your home and picking up, putting things where they belong, and tidying up is a great way to keep your home clean throughout the week. It can be easy to be in a rush and leave your breakfast plate or your cup of sleepytime tea on the table, but make sure you pick it up right away. Don’t leave it sitting there for days! These are a few quick and easy tips that you can use to help keep your home clean between professional cleanings. We promise it won’t be that hard. Just stick with it and your home will look good day after day! No more messy house hours after cleaning the entire thing, simply do these quicky cleaning tasks daily (or every other day) and enjoy a home that is clean and tidy. When you need a full on clean, be sure to contact Clean Bees Homekeepers. We can give your home the clean you need and allow you to enjoy it without lifting a finger! Request a cleaning estimate today to get started!